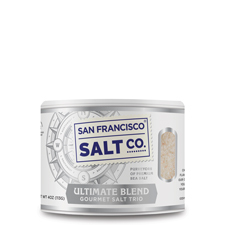 Three of our most beloved natural salts, Sherpa Pink® Himalayan Salt, French Grey Salt, and Pacific Sea Salt come together in perfect harmony to create our Ultimate Blend. 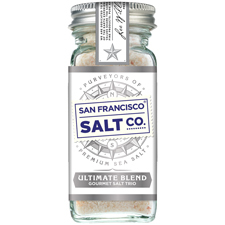 This salt is an instant kitchen staple that adds more depth and richness to meals than standard table salt. This is an exclusive, unique blend that you won’t find anywhere else! SHERPA PINK HIMALAYAN SALT - Formed over the last 250 million years, Pink Himalayan Salt is considered the purest and most beautiful salt in the world. We leave our Himalayan Salt raw in its natural state to preserve its richness in nutrients and minerals. Pink Himalayan Salt re-mineralizes the body with minerals and trace elements essential to our health and wellbeing. 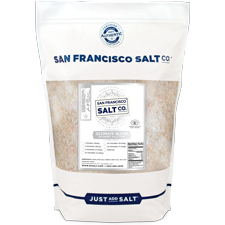 PACIFIC OCEAN SEA SALT - A pure and natural sea salt with a crisp flavor that contains no anti-caking agents or artificial ingredients. Pacific Sea Salt is made through the ancient process of slowly evaporating sea water to collect its salt and natural trace elements. 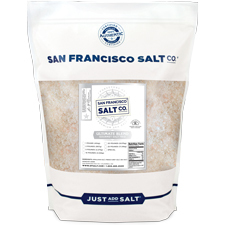 Our salt is harvested off the coast of Northern California from the waters of the Pacific Ocean. 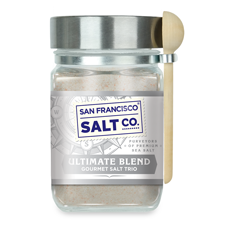 FRENCH GREY SEA SALT - Brimming with earthy flavor, this salt is favored by top chefs around the globe. French Grey Salt is formed as the sea water flows into the French Guerande Marshes, during high tides. It is hand-harvested by salt workers using skills and methods over a thousand years old. Sel De Guerande obtains its natural grey coloring from the salt crystallizing on clay, which makes it dense in flavor and nutrients. Our French Grey Salt is 100% natural and carries the Nature & Progrès' certification label from France. DESCRIPTION - A blend of Himalayan Salt, French Grey Salt and Pacific Ocean Sea Salt. Packaged in our U.S.A., SQF Quality code compliant facility. 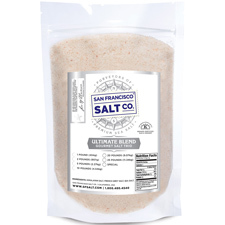 PROPERTIES - Our 100% natural Sherpa Pink® Himalayan Salt, French Grey Sea Salt, and Pacific Ocean Sea Salt are all Kosher Certified, Non-GMO, and do not contain any MSG, Soy, Gluten, Dairy, anti-caking agents, artificial colors, or additives.